Europa Group Hotels offers the conference centers located at the prestigious locations in Lithuanian, Latvian and Romanian cities. The centers are perfectly suited for company meetings, events, seminars and conferences and are equipped with air conditioning, high-quality audio and video equipment, wireless internet. An excellent quality of your event will be ensured - everything will be taken care of by our hospitable hotel staff. We provide full service, coffee breaks, business lunches and banquets prepared by our hotel restaurants. 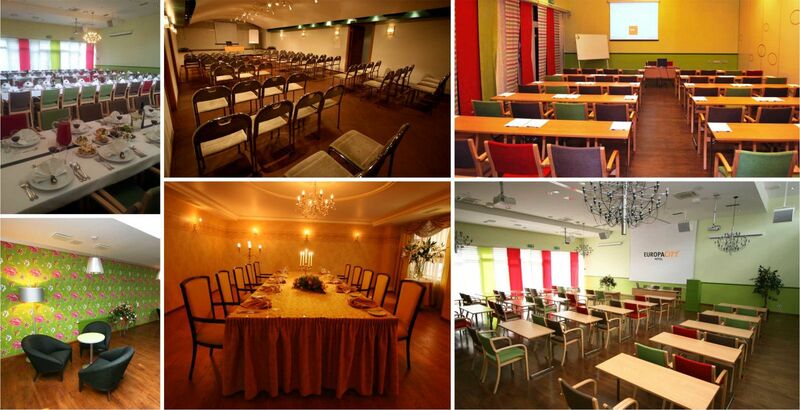 Europa Royale and Europa City Hotel Conference Centers - in Vilnius, Kaunas, Druskininkai, Riga, Liepaja and Bucharest. Please contact our sales team to ask corporate price. If you are looking for conference facilities in Vilnius, a four-star Europa Royale Vilnius hotel will offer you 2 newly renovated conference rooms. Conference facilities are air-conditioned, feature modern audio and video equipment, wireless internet, up-to-date conference amenities, natural daylight and innovative menus customized for different types of meetings and events. As to your personal business needs, the hotel invites you to use the business center equipped with latest office equipment. The conference centre offers you 8 modern, different-sized conference halls as well as two meeting rooms for up to 25 and 50 persons. All conference halls can fit up to 900 persons. The biggest conference hall capacity is up to 250 persons. Should you be holding a conference, seminar, presentation, training session, brainstorming session with your team, planning a board meeting or a business interview, Europa City Amrita hotel offers the most comfortable and modern conference facilities in Liepaja. Kviečiame Jus organizuoti įmonės susitikimus, seminarus ir konferencijas puikiai įrengtose konferencijų salėse prestižinėje vietoje Vilniaus senamiestyje. Nepriekaištingą Jūsų renginio kokybę užtikrins konferencijų salėse įrengtas oro kondicionavimas, moderni konferencinė įranga, aukštos kokybės garso ir vaizdo įranga, bevielis internetas, jauki aplinka, natūrali dienos šviesa ir specialiai Jūsų susitikimui ar renginiui paruoštas restorano "Medininkai" meniu viskuo pasirūpins paslaugus viešbučio personalas. Fully equipped Europa Royale Bucharest meeting & conference halls will be able to accommodate up to 60 guests each.